Lake Superior waves are as timeless and powerful as the glaciers that created it and they slap, roll, and gently lap the sand as endlessly as the water stretches into the horizon. The waves are piling mountains of sand in Grand Marais Harbor. Grand Marais citizens are trying to raise the $1.5 million needed to build a new break wall and dredge the increasingly silted in harbor.Grand Marais offers tourist and historical activities for all four seasons. Snowmobiling and cross country skiing are popular in the winter and swimming, boating, kayaking, and fishing attract summer visitors. Grand Marais Harbor is the site of the annual Great Lakes Sea Kayak Symposium, an event that attracts hundreds of sea kayakers from around the country. 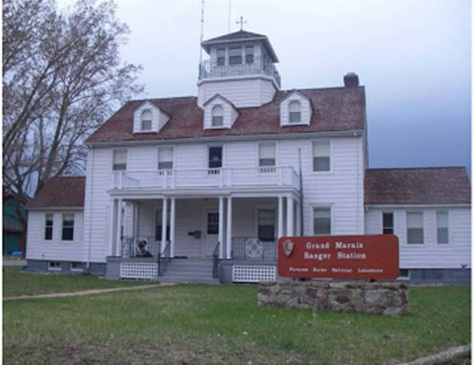 The Grand Marais Maritime Museum is located in the former Coast Guard Station. Burt Township Supervisor Jack Hubbard said, "The economic impact of this harbor is huge. The entire community of Grand Marais is built around this harbor; it is the heart and soul of this community. Without this harbor, this town will not exist as it does today." French voyageurs first discovered the beautiful natural harbor at Grand Marais in the 1600s and made many voyages to Grand Marais, a name that they used to mean a "harbor of refuge" as well as a big pond or marsh. Early explorers and mariners used the harbor as a refugee from Lake Superior’s fierce storms. The fishing and lumbering industries established themselves in Grand Marais in the 1860s, and it grew into a boom town. By the mid 1800s, Grand Marais harbor became the harbor of refuge along Lake Superior’s southern shore. In 1880, the federal government designated Grand Marais Harbor an official Harbor of Refuge, the only one along a ninety mile stretch of Lake Superior coastline from Whitefish Point to Munising. In 1896, the United States Army Corps of Engineers designed two parallel jetties out into Lake Superior and built a 5,770 foot a timber pile breakwater from the east jetty to Lonesome Point. The jetties and the breakwater closed the harbor and prevented the sand from shoaling it in. The breakwater provided a stable and effective barrier from Lake Superior’s storms. Many shipwrecks have occurred at or near Grand Marais, including the loss of the 729 foot ore carrier Edmund Fitzgerald on November 10, 1975. The Edmund Fitzgerald disappeared in hurricane force winds and 25 foot waves north of Whitefish Point, about 55 nautical miles east northeast of Grand Marais. The Grand Marais Coast Guard Station made the last land based radio communication with the Edmund Fitzgerald late in the afternoon of the day Lake Superior claimed her. The anchor of the wrecked Annie M. Peterson rests near the Veteran’s Memorial in Grand Marais. By the 1940s, the commercial fishing and lumbering in the region declined and during World War II, the Corps of Engineers stopped maintaining the timber pile breakwater permanently. Without maintenance, it didn’t take long before Lake Superior waves totally destroyed the timber pile breakwater and once it disappeared, sand quickly piled up in Grand Marais Bay. Originally, Grand Marais Bay reached a depth of 55 feet and today it is only 25 feet and Lonesome Point is severely eroded. Lake Superior deposits sand in Grand Marais Harbor at the rate of 100,000 cubic yards per year and engineers estimate that the harbor will be completely silted up in two to seven years. A Harbor Committee was created to investigate building a new break wall and in 1998, Congress authorized funds for an independent study of the harbor and break wall situation in Grand Marais. Dr. Guy Meadows, director of the University of Michigan College of Naval Architecture and Marine Engineering, completed the study using a special underwater rover. He finished his preliminary report spelling out options for rebuilding the break wall and repairing the damage to the harbor in time for Congressional Budge appropriations requests in February 2000. In the next ten years, only Lake Superior took definitive action. Lake Superior continued to pile sand in the harbor and send waves over the submerged foundations of the break wall. Congress appropriated funds and in 2010 the Army Corps of engineers had developed plans to build a new break wall at a cost of about seven million dollars. The Corps of Engineers didn’t implement their plans because they said they ran out of funding. "Somebody has to take care of this situation,"　Supervisor Hubbard said. "If the federal government isn't going to do it, they need to have the intestinal fortitude to tell us no, we're not going to do it, you guys are on your own on this one and let us come up with the solution." Burt Township has held fund raisers and is concentrating on private grant foundation funding. In the meantime, Lake Superior keeps building sand mountains in Grand Marais Harbor.